First peel the skin off the jicama using a peeler or sharp knife. Then cut the jicama into thin strips. Use the large side of a box grater to shred in the 2 granny smith apples. You don’t even need to peel the apple. Squeeze the juice from both limes over the jicama and apple mix. Finely chop the cilantro and add in to the mix. Stir in the chili sauce and salt. You can adjust the chili sauce to taste- leave it out if you don’t like things too hot, or add more if you like it spicy! 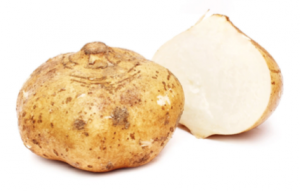 Jicama is a root vegetable, which means it grows underground. Jicama can grow up to 50 pounds! However, for best taste it should be harvested before it reaches 5 pounds. Jicama is high in fiber which is helpful for the digestive system and helps your body feel full and satisfied. Jicama is high in anti oxidants which can help your body fight disease.